When USC offered North Shore (TX) CB Dorian Hewett‍ last month, not many were familiar with him. The Trojans came on late in the process for Hewett after he decommitted from Syracuse a few days after a Jan. 11 official visit to Utah. Washington also offered at that time. An in-home visit from Clay Helton and staff last week led to an official visit this past weekend and TrojanInsider.com caught up with him yesterday before the Super Bowl. SS: Do you recall when you first heard from USC? Dorian Hewett: "I think it was the week I decommitted from Syracuse (Jan. 15)." SS: Was USC a school you had even entertained thoughts of visiting before that? Hewett: "To be honest with you, no. I had never thought USC would ever have any interest in me. But when they showed interest, I knew I had to go check it out. The way the coaches were talking to me during the in-home visit convinced me to head up there for my final weekend." SS: How much did you know about USC before the coaches came into you home (Jan.30)? Hewett: "I didn't know USC was a private school and when they told me that, it really bumped them up for me. And the coaches are just wonderful." SS: What did you get out of the official visit to USC that will potentially lead to you signing with there on Feb. 6? Hewett: "When I'm on a visit I want to be around the players and that's a big part of what I'm looking for on signing day. I want to know if I'm a good fit around those guys. SS: What was your impression of the players at USC, what was the feeling you got from them? Hewett: "That they're a family and they're not just in it for football. They're there for another learning experience, but they know how to go get it when it's football time." SS: Normally there are aspects of a visit that impress you guys and even disappoint. Was there any of that this weekend? Hewett: "The facilities really impressed me a lot. They have the best facilities I've seen on any of my visits. That really impressed me, but there was nothing that disappointed me." SS: What are you thoughts on Clay Helton? Hewett: "He's a great man, that's the first thing that stood out about him. He's a great man and he's going to look out for his players." SS: USC isn't close to home, not that it matters much to a lot of you guys, but how did L.A. feel to you? Hewett: "It's L.A. and I didn't see anything I didn't like. SS: What position are they talking about you playing at USC? Hewett: "They want me to play some safety and nickel. That's the role most of the coaches from the schools recruiting me see me playing." SS: What is left for you between now and signing day. Have you already had enough conversations with your family and those close to you, or do you still have some thinking to do? Hewett: "Right now I'm still doing some thinking until Feb. 5, but everyone will know on Feb. 6 where I'm going. I'm going to have a reveal on Signing Day at my school. I'll have hats on a table and my parents will be wearing shirts from the school i'm signing with. It will be around 11am or 12pm, but I'll let you know for sure." SS: How exciting has it been to have a lot happen late in the process? Hewett: "It's been a very exciting time. A lot of kids don't get to experience what I've been experiencing and I just look at all this as a big blessing. I don't have to worry about my parents paying for my college and that's a big blessing." SS: Football aside, what did the people at USC show you? 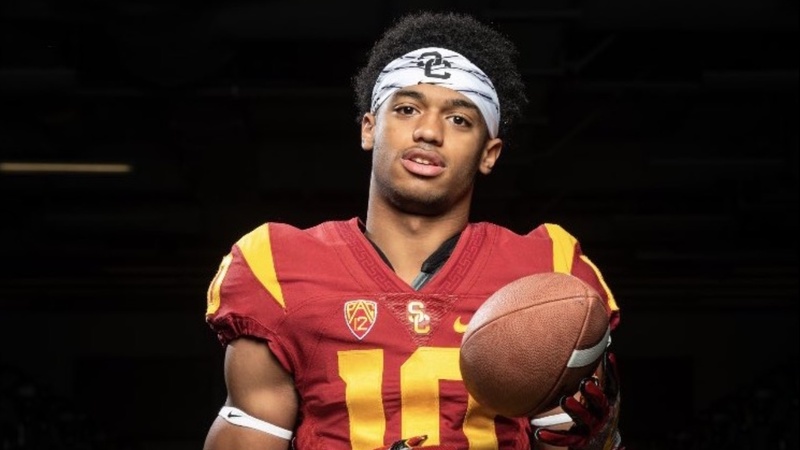 Hewett: "They showed me if I become a Trojan, that means I'm going to be connected for life. I'll have a lot of benefits from people all around the world." SS: How powerful is it when you hear something like that? Hewett: "That's amazing. To know you're going to have something like that for life, even if you don't make it to the league (NFL), it means a lot." We’ll post an update the time for Hewett’s plans on signing day when we learn more.